We can provide supreme Medieval Costumes for men or ladies. From Bandits and Riff Raff to the Sheriff of Nottingham Outfits. This Robin Hood Movie, Russell Crowe Costume, is a sample of what we can do for you. Period Attire, Post Medieval, Late Medieval, Medieval Fantasy or whatever, we have all the components needed to get you the costume of your dreams. Robin Hood: Prince of Thieves, Sheriff of Nottingham, Alan Rickman Costume. We have all of the Robin Hood Movie Characters from any movie. Let us help you assemble your own version of Sheriff of Nottingham, or any other character outfit. We have great wigs, makeup, leather and faux leather attire, swords and other weapons, baldrics, accessories and more. Robin Hood Prince of Thieves Evil Sheriff of Nottingham Costume. We have plenty of great Scarborough Fair Medieval Costume Ideas. 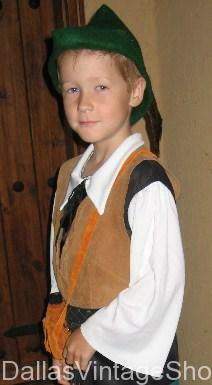 We have plenty of Medieval, Renaissance or other Historical Period Costumes like this Robin Hood School Project Costume. You will find Child Theatrical Costumes and amazing Halloween and kid’s Themed Birthday Party Costume Ideas. We have children’s historical, theatrical and Halloween costumes. We have complete outfits or just the pieces you need. Remember Ahchoo? The Dave Chappelle, ‘Robin Hood, Men in Tights’ character? We have all the characters costumes of all the Movie Versions of Robin Hood you can imagine. Get serious characters outfits or get satirically ridiculous characters. We’ve got then all, so let us hook you up. You are in Robin Hood category.